Club Meeting Location to Morris County. and arrangements were made by the Board to make it happen. The new location was to be used starting in April, 2019. However, vociferous members complained and demanded a new vote on whether to move or not. Will be held at the March 21, 2019 Meeting at Kenilworth. and why it is important that all members to attend. 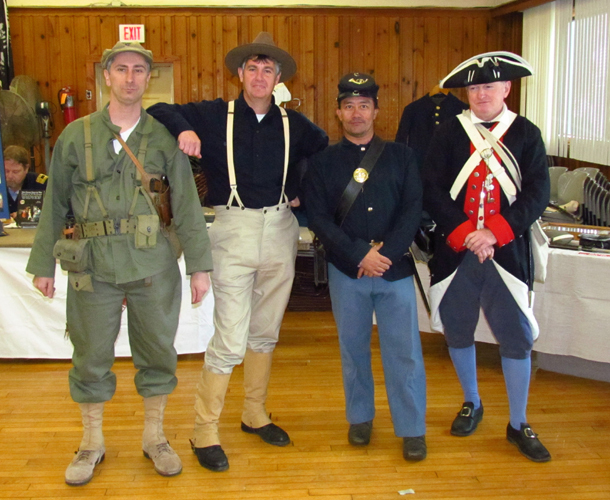 Our 2018 Veteran's Tribute and Military Exhibition was well received at the Wharton American Legion last November. However, traffic was light and we had hoped for more visitiors. Wharton holds an Annual Canal Day where thousands of locals attend. This is just around the corner from the American Legion Hall. the NJACC constitution has been modified to reflect mandatory membership in the NRA. Benefits of being a 100% NRA Affiliated Club include the ability to apply for Grants of up to $5000 for Range improvements and to apply for NRA Memberships at a discounted rate. New and Renewal memberships in the NRA are only $30. The club will receive $5.00 for each renewing member or $10 for each new member who signs up through the NJACC. You may join on-line through this link that the NRA has provided to us. Members in good standing, including Corresponding Members are permitted to purchase items available from the CMP. Please contact Club Secretary Tom Plante for a CMP Club Membership Form. I will certify your membership in the NJACC and send you the form to send in with your other requirements for CMP purchases. For information on becoming a member of the NJACC, please visit our Membership Webpage. we have adopted a standard set of rules for all our matches. These rules go into effect will all future matches. obituaries, and additional sensitive info. A login and password is required in order to enter this section of the website. you may call or email me for the password.